If you’re a movie buff you’ll no doubt realise that the 2019 line up of UK film releases is set to be dominated by sequels. And rounding off the year in style Star Wars: Episode IX is due to be released just in time for Christmas 2019. Although some film critics will no doubt bemoan the prevalence of follow-on storylines in 2019, studios no doubt realise when they’re on to a good thing and aren’t looking to reinvent too many wheels this year (not unless they’re in live action in any case). Here at Millbrook Beds, we get it. We’ve been perfecting the story of perfect sleep for over 70 years now. We might have new releases, sequels and instalments in our collections over the years (although no live action versions to date!) the central themes of traditional craftsmanship, quality, pocket sprung comfort and luxury sleep remain throughout. 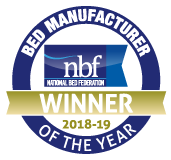 Stick to the quality sleep you know and love in 2019 with luxury #perfectsleep handcrafted by Millbrook Beds.